Somebody on BNN was telling the world that this is a clear buy, simple because they have the very best management team that you can possible get. I have no reason to doubt that they have and the chart alone is evidence enough that they have made a major accomplishment. But that is all in the past, and now the real question is what do you do for an encore? Every company, like humans and so on, grow in spurts and have successful periods that alternate with less successful periods. Starting in 2010 this company has only enjoyed increasingly better and better times. We would hope that that could be continued but reality suggests otherwise. So does EW. It is not possible to count the waves up in any meaningful way, so we have broken it down to three periods that we then call waves 1, 3 and 5. The last little bit is almost vertical which is simple unsustainable. Then you see the crack in the armor appearing loud and clear, $24 on $94 or 25.5%. 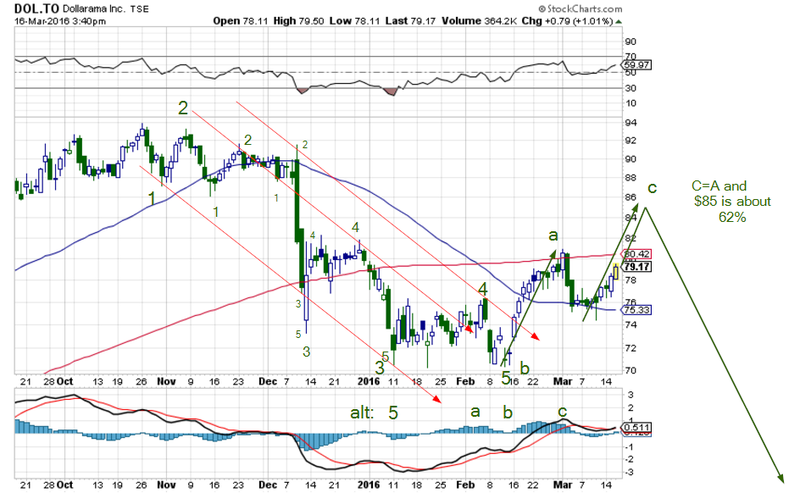 More importantly we think it is a 5-wave drop. That means there is more to come after a suitable period to regain it’s composure. 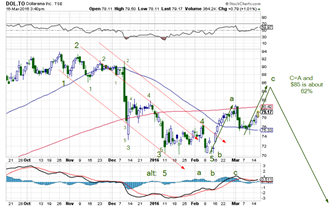 We suspect that that might be at the $85 level where c=a and the retracement is about 62%. A sell at that level or a little lower.